The Kantō region (関東地方, Kantō-chihō) is one of Japan's regions. The Japanese conventions of geography and history divide the nation into eight regions, including the Kantō region. These have been used since 1905 as basic units for description and comparison and as cultural markers. In the late 7th century, the Tōkaidō region were identified as one of the eight largest administrative areas of the Imperial system (ritsuryo seido). Gokishichidō is an ancient system of names for parts of the country, including Tōkaidō. Kantō covers an east-central area of the island of Honshū in roughly the same area as the traditional Tōkaidō. The region of Kantō covers the east-central part of the island of Honshū. In the Meiji period, the modern regional system was made by Imperial decree. Japan was divided into regions (chihō), including the Kantō region. A regional council (chihō gyōsei kyōgisai) was headed by the governor of the most powerful prefecture in the regional grouping. The council also included regional chiefs of central government ministries. Over time, Kantō developed its own regional dialects, customs and unique traditional culture. 1923 (Taishō 12): Great Kantō earthquake has its epicenter near Tokyo and Yokohama. The region includes the Greater Tokyo Area. 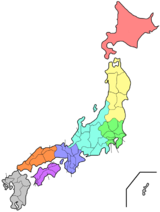 The Kantō covers seven prefectures: Gunma, Tochigi, Ibaraki, Saitama, Tokyo, Chiba, and Kanagawa. "North Kantō" (北関東, Kita Kantō) covering Ibaraki, Tochigi, and Gunma. "South Kantō" (南関東, Minami-Kantō) covering Saitama, Chiba, Tokyo and Kanagawa. South Kantō is often used as synonymous with the Greater Tokyo Area. East Kantō (東関東, Higashi-Kantō): Ibaraki, Tochigi and Chiba. West Kantō (西関東, Nishi-Kantō): Gunma, Saitama, Tokyo, Kanagawa (and Yamanashi Prefecture may be included). Inland Kantō (関東内陸部, Kantō nairiku-bu): Tochigi, Gunma, Saitama (and Yamanashi may be included). Coastal Kantō (関東沿岸部, Kantō engan-bu): Ibaraki, Chiba, Tokyo and Kanagawa. The Japanese national government defines the National Capital Region (首都圏, Shuto-ken) as the Kantō region plus Yamanashi Prefecture. Japan's national public broadcaster NHK defines the "Kantō broadcast area" (関東甲信越, Kantō-kō-shin-etsu) which includes Yamanashi, Nagano and Niigata Prefectures for regional programming. ↑ Nussbaum, Louis-Frédéric. (2005). "Geography" in Japan Encyclopedia, p. 242; "Kantō", p. 478. ↑ Library of Congress Country Studies, Japan (LOC), "Geographic Regions"; "The islands of Hokkaido, Shikoku, and Kyushu each form a region, and the main island of Honshu is divided into five regions"; retrieved 2012-4-3. ↑ Japan Ministry of Foreign Affairs (MOFA), "Regions of Japan"; retrieved 2012-4-11. ↑ LOC, "Kanto"; retrieved 2012-2-14. ↑ "Yokohama is Practically Destroyed," New York Times. September 3, 1923; retrieved 2012-2-15. Wikimedia Commons has media related to Kantō region.